The acclaimed California Redwood Chorale presented the world premiere of Randall Keith Horton's moving and electrifying musical-theatrical tribute to one of America's most gifted folk musicians, the late Kate Wolf. Along with original pieces, the choral ensemble piece included some of Wolf's best-known songs, including 'Across the Great Divide,' 'Give Yourself to Love,' 'Red Tailed Hawk,' and more. The California Redwood Chorale was joined by musician Don Coffin, mezzo soprano Bonnie Brooks, singer Michael Fontaine, saxophonist Michael Bolivar and vocalist Jacob Brown. 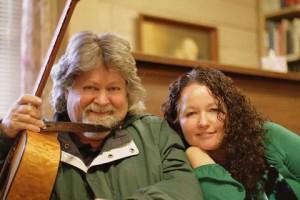 Horton created the choral composition "Unfinished Life" ( subtitled " Dreams, Friendships and Farewells " ) in memory of his 1980 concert performance with the late singer-song writer Kate Wolf. 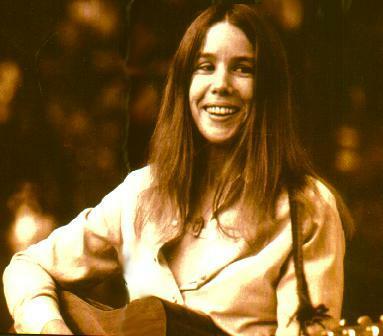 Kate's life was tragically cut short in 1986, as her career in folk music was blossoming, nationally. One of Kate's songs is entitled "Unfinished Life". 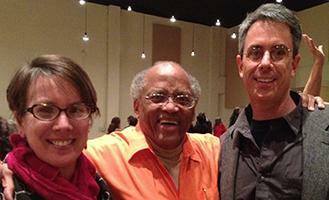 Randall created the choral composition exclusively from Kate's songs, in a quasi-biographic, story-telling style. Randall's great appreciation goes out to the California Redwood Chorale, its Founder-Executive Director, Ms. Gerry Schultz; to its Music Director, Mr. Robert Hazelrigg; especially to Ms. Gloria Strasburg, whose years of dedication to this project helped to bring it together; and to Kate's family: Hannah Wolf, Max Wolf, and Terry Fowler. Sonoma County singer-songwriter Kate Wolf died of leukemia in 1986, when she was just 42. Now her enduring music is being presented in a new form—as a choral composition that will get its world premiere on her home turf this weekend. 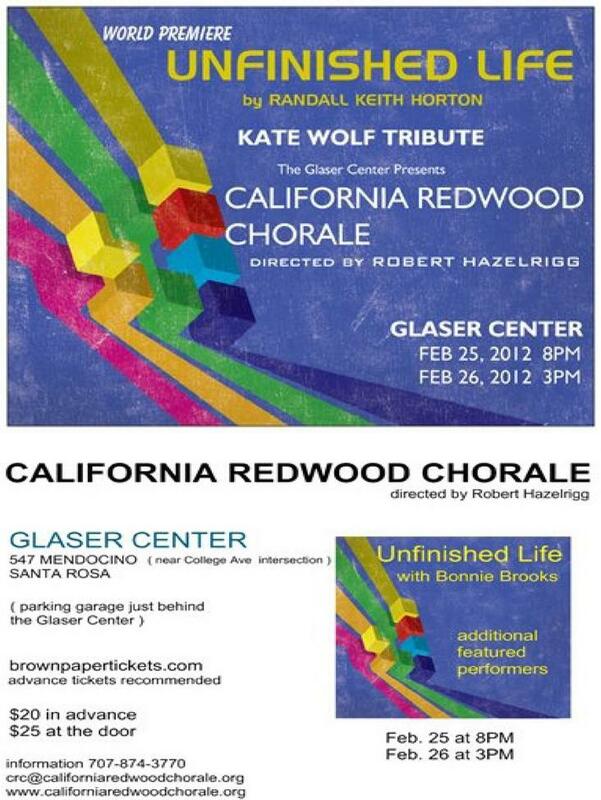 Unfinished Life uses 13 of Kate Wolf's songs to craft an impressionistic choral biography of the late singer-songwriter. But composer Randall Keith Horton says he intends the 20-minute piece as both a tribute to her music, and a personal appreciation of her generous nature. To prepare for writing "Unfinished Life," composer Randall Keith Horton immersed himself in her recordings, where he found several recurring themes that he incorporated into the work. One of the most significant, he explains, was dreams. Much of Kate Wolf's music carefully observes the natural world, its flora, fauna and topography, but it speaks at other levels simultaneously. Horton says his approach, as composer, was more metaphorical, as in the way he wove in one of her best-known songs, "Across the Great Divide." 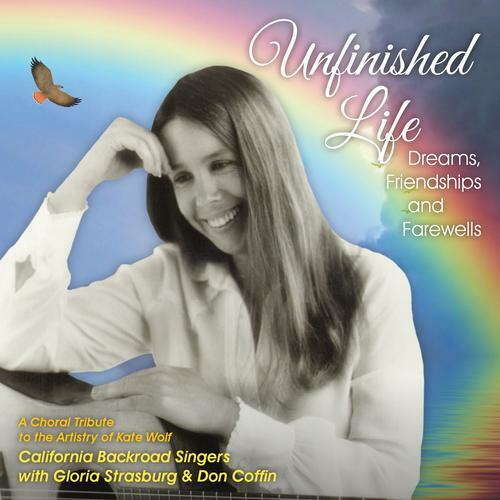 A labor of love for several years, the choral-music album (CD) Unfinished Life, Dreams, Friendship and Farewells was released in 2017. In composing the music, Randall chose lyrics and melodies from several of Kate's songs - to musically interpret of a part of her life story. The choral singers and folk-guitar accompanists - The California Backroad Singers, most of whom are (or were) members of the California Redwood Chorale (see above) - provided invaluable musicianship to this project! In New York City, the phenomenal choral ensemble, the Cerddorion Vocal Ensemble, contributed their professional artistry to Horton's challenging musical score! Dr. James John, Artistic Director of Cerddorion, has been Randall's mentor in the field of choral conducting and conducted the beautiful singing of his ensemble in this recording (recorded in Brooklyn, NY). The guitarists and banjo accompanists in the New York branch of this great team effort are credited in the eight-page booklet, seen below, as are the great engineers, artists, professionals, friends and backers of this great project. The choral singers and folk-guitar accompanists - The California Backroad Singers, most of whom are (or were) members of the California Redwood Chorale (see above), provided invaluable musicianship to this project!